Although many new cellular assays entered the drug discovery scene over the course of the last decades, we still lack a predictable tool when it comes to selecting compounds or cell lines for xenograft testing. What is lacking? Cellular models do not account for the challenges the compounds face when injected in a mouse such as high serum concentration, the presence of inhibiting factors in the mouse or simple pharmacokinetic1 or biodistribution issues. How about performing the compound screening in a mouse body instead? Hollingshead2 et al. from the National Cancer Institute had the brilliant idea to restrict the growth of tumor cells to hollow fibers consisting of a semi-permeable membrane that allows the compounds to enter and act on the cells. In short: A 3D cellular proliferation assay performed inside a mouse body. Hollow fibers of one millimeter in diameter and two centimeters in length get implanted in mice in two locations, under the skin and into the peritoneum. Fibers containing cells from up to three different tumor cell lines can get implanted into each location – six fibers per mouse. Hollow fibers get filled with tumor cell suspension, the ends get closed and the fibers are implanted into the mouse. The fibers stay in the mouse for a couple of weeks while the mouse receives treatment. The fibers limit the movement of the tumor cells, whereas nutrients, gases and compounds can travel freely. Finally, fibers will be isolated and antitumor effects of the compound will be evaluated by quantification of live cells. The membrane cut off is 500kDa allowing the assessment of antiproliferative effects of small molecule compounds, antibodies as well as antibody-drug-complexes. The Hollow Fiber Model is a tool to select compound candidates as well as cell lines for successful in vivo xenograft testing. ProQinase, a contract research organization specializing in the field of anticancer drug development, made the Hollow Fiber Model available for the drug discovery community. Compound prioritization: Because of small group sizes of three to six mice the antiproliferative capacity of up to 14 compounds can be compared head-to-head in one mouse study. Selection of suitable tumor model: Investigation of the efficacy of the compound against 12 cell lines in a single mouse study is possible. Proof of target engagement and pharmacodynamic effects3 such as inhibition of enzyme activity, DNA damage4, microtubule disruption5 and cell cycle6 can get analyzed. A comprehensive study was performed to demonstrate the predictive value of the Hollow Fiber Model (see figure below). Nine cell lines were tested, and the Hollow Fiber Model predicted the responses in the xenograft study in every case. This result is consistent with a study performed in Korea7 with 20 cell lines showing a predictive value of 92%. Further, a predictive value of 93% was shown for a study performed with patient-derived cell lines8 in China. At present, limitations exist for compounds that do not act directly on the tumor cells such as immune-modulating compounds or compounds that interfere with tumor-stroma communication. Kinase inhibitor Crizotinib was tested for tumor growth inhibition against 9 cell lines in the Hollow Fiber Model (red) and in subcutaneous xenograft studies (grey). Preselection of tumor model and compound candidates is more economic because it reduces the number of xenograft studies. Fewer mice are needed due to the low variability of the assay that allows for small group sizes. Because of the short study time, fewer animals per group and an overall reduced study number less compound is needed. The Hollow Fiber Model delivers results in just two weeks. The Hollow Fiber Model has the potential to change the way drug discovery is done. 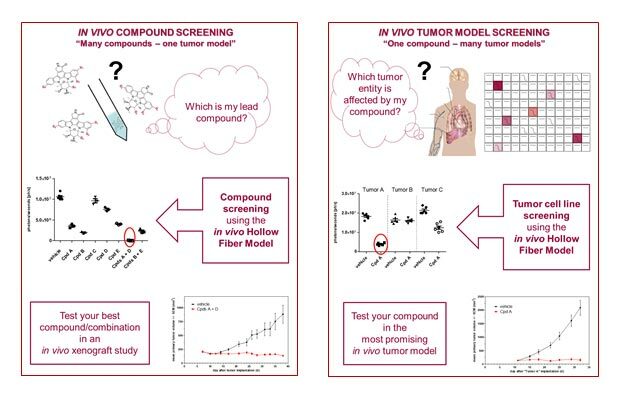 The NIH, for example, incorporated the Hollow Fiber Model into their drug discovery routine: “the hollow fiber assay is […] being utilized as the initial in vivo experience for agents found to have reproducible activity in the in vitro anticancer drug screen.”9 The assay is now available for every lab in academics, biotech or pharma for testing new anticancer drugs which may substantially speed up the process and increase the chances of successful drug discovery.